The New Yorker's Lauren Collins briefly depicts Huffington holding hands with ex-boyfriend Mort Zuckerman at the recent Time 100 party. But who is she seeing now? Is it true she tends toward hot younger men? What about her rumored dalliance with Newark Mayor Cory Booker? Collins also delves into the much-explored topic of Huffington's affiliation with spiritual guru John-Roger. But what about how she has stocked her site with fans of the culty leader? Just one paragraph on the Tim Russert feud? Can she still not come up with anything nice to say? Is it true top NBC News staff hated her even more after Russert died? How does Arianna run the Huffington Post? What's it like to work there? It's hardly surprising or scandalous that Huffington can be an "erratic... high-strung boss" or that she has lost 15+ employees, as reported in the profile. Sample quote: "One of the frustrating things was that she had absolutely no compunctions about saying, ‘Hey, do this,' and then saying, ‘Why did you do that? I never asked you to do that.'" The New Yorker might start with HuffPo's political message discipline. Huffington has spiked work that is not "congruent with HuffPost's editorial position against the media's penchant for viewing everything through a left/right prism," a convoluted position she formulated after one of her columns was used against Barack Obama. Which raises the question: Was HuffPo biased toward Obama? After the site reported that Obama said "bitter" working-class Americans "cling to guns or religion," HuffPo co-founder Ken Lerer, who himself said to be unhappy about the story, rushed to talk with angry Obama campaign operatives. That would be the same Lerer who convened a fundraiser for Obama at his apartment the year prior, when he was still CEO of Huffington Post. It's worth at least asking whether the Clinton campaign's accusation that the site was a "conveyor belt" for pro-Obama propaganda was more than mere campaign flackery. Also, why did HuffPo delay covering the latest scandal stories on Democratic politician John Edwards, despite having broken some of the earliest ones? If the HuffPo has been called an "internet newspaper," as the New Yorker reminds us, Collins would have been well-served to take a look at how much it spends on actual reporting. Mayhill Fowler, arguably its brightest star at the moment, paid her own expenses and received no salary. Huffington herself said many staff left because they "wanted to be writers.... the jobs are administrative." 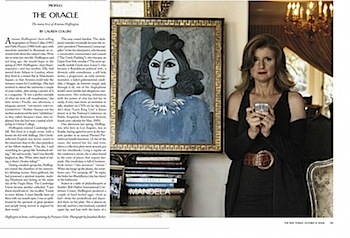 To fit in some of these topics, the New Yorker might have had to cut out the bits about Huffington's "considerable intelligence," her "seductive" charm and how she likes hiking, "yoga, meditation and prayer." But at least the magazine would have broken some significant new ground. UPDATE: The Huffington Post itself writes of the profile, "readers don't get much insight into how [Huffington] has actually pulled off this impressively successful website and gained a distinctly new status amid the bloody competition of the Internet."